U12-dependent (U12) introns have persisted in the genomes of plants since the ancestral divergence between plants and metazoans. These introns, which are rare, are found in a range of genes that include essential functions in DNA replication and RNA metabolism and are implicated in regulating the expression of their host genes. U12 introns are removed from pre-mRNAs by a U12 intronspecific spliceosome. Although this spliceosome shares many properties with the more abundant U2-dependent (U2) intron spliceosome, four of the five small nuclear RNAs (snRNAs) required for splicing are different and specific for the unique splicing of U12 introns. Evidence in plants so far indicates that splicing signals of plant U12 introns and their splicing machinery are similar to U12 intron splicing in other eukaryotes. In addition to the high conservation of splicing signals, plant U12 introns also retain unique characteristic features of plant U2 introns, such as UA-richness, which suggests a requirement for plant-specific components for both the U2 and U12 splicing reaction. 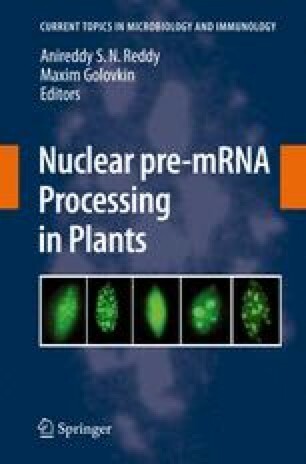 This chapter compares U12 and U2 splicing and reviews what is known about plant U12 introns and their possible role in gene expression.